An Updated Version of this Study can be Found Here. As Congress begins to debate tax reform in the coming months, there is one tax that they should pay close attention to: the capital gains tax. The capital gains tax is a tax on profit through the sale of property or investments. At the beginning of this year, the top marginal statutory capital gains tax rate was increased to 23.8 percent from 15 percent. Although lower than the tax on ordinary income, states also tax capital gains, some of them as high as 13.3 percent, adding an additional tax burden to savers and investors. Some taxpayers could pay up to a 33 percent tax on capital gains, a rate that far exceeds rates throughout the world. This high tax rate has long-term negative implications for the economy as people save and invest less and capital seeks higher returns in other countries. Lawmakers should consider the negative economic impacts of such a high tax on investment and look to lower it in any tax reform package. Compared to individual countries in the OECD, seven of ten of the top capital gains rates are U.S. states. (See Table 2, below.) California, with a top rate of 33 percent, is the second highest capital gains tax rate in the world, a rate higher than France, Finland, and Sweden. Eleven OECD countries have no capital gains tax at all. Since the fiscal cliff deal, capital gains tax rates have risen substantially. Taxpayers in every state are subject to a top capital gains tax rate higher than the OECD average. American lawmakers should recognize the combined burden of both state and federal capital gains taxes and the drag that they create on the economy. There are several reasons high capital gains taxes are problematic in terms of economic growth and fairness. Capital gains taxes represent an additional tax on a dollar of income that has already been taxed multiple times. For example, take an individual who earns a wage and decides to save by purchasing stock. First, when he earns his wage, it is taxed once by the federal and state individual income tax. He then purchases stock and lets his investment grow. However, that growth is smaller than it otherwise would have been due to the corporate income tax on the profits of the corporation in which he invested. After ten years, he decides to sell the stock and realize his capital gains. At this point the gains (the difference between the value of the stock at purchase and the value at sale) are taxed once more by the capital gains tax. Even more, the effective capital gains tax rate could be even higher on your gains due to the fact that a significant difference in the value of the stock is due to inflation, not real gains. These multiple layers of taxation encourage present consumption over savings. Suppose someone makes $1000 and it is first taxed at 20 percent through the income tax. This person now has a choice. He can either spend it all today or save it in stocks or bonds and spend it later. If he spends it today and buys a television, he would pay a state or local sales tax. However, if he decides to save it, delaying consumption, he is subject to the multiple layers of taxation discussed previously plus the sales tax when he eventually purchases the television. As an individual, to avoid the multiple layers of taxation on the same dollar, it makes more sense to spend it all now rather than spend it later and pay multiple taxes. As people prefer consumption today due to the tax bias against savings, there will be less available capital in the future. For investors, this represents less available capital for factories, machines, and other investment opportunities. Additionally, the capital gains taxes create a lock-in effect that reduces the mobility of capital. People are less willing to realize capital gains from one investment in order to move to another when they face a tax on their returns. Funds will be slower to move to better investments, further slowing economic growth. Relatively high capital gains taxes also harm the competitiveness of U.S. corporations by raising the cost of capital. As corporations seek higher returns, corporate investment will move to countries that have lower capital gains tax rates. Following the reduction of capital gains tax rates in the U.S. in the late 1970s from 35 percent to 20 percent, the ability of firms to raise funds through equity offerings greatly increased. As a result, the daily volume of the New York Stock Exchange increased from 28.6 million shares to 85 million shares in five years. Higher rates will also slow down the productivity of businesses as there is less investment in new machinery and software. Having a relatively high capital gains tax rate compared to the rest of world is a clear drag on the competitiveness of U.S. businesses. In 2009, revenue from capital gains was $37 billion, which is nearly a 20-year low. Many claim that if the government were to lower the rate further, tax revenue would fall even farther. However, history has shown that this is not necessarily true. In fact, revenue collected from realized capital gains increases in years following a drop in the tax rates. (See Figure 2.) Even more, the CBO, in a review of the literature, found that capital gains realizations are extremely sensitive to tax rates and raising rates wouldn’t necessarily result in additional revenue. What seems to be more important to capital gains revenue is economic growth. As Congress begins debating tax reform, members need to take a serious look at the U.S. capital gains tax rate. There is not much lawmakers in Washington can do about state tax policy, but they can be mindful of the combined effects of state and federal policies. With an average rate of 27.9 percent and a top rate of 33 percent in California, investment in the U.S. is at a severe competitive disadvantage. Investors could easily start looking for higher rates of return in other countries with much lower tax rates or simply choose to reduce domestic investment and instead consume more. The United States risks losing its competitive edge as other countries continue to reform their tax systems to attract businesses and promote economic growth. Policy makers here in Washington need to recognize that a high tax burden on capital gains harms growth and prosperity. Most of the world’s leaders have and as a consequence the United States is falling farther behind. Joseph Henchman, Details of the Fiscal Cliff Deal, Tax Foundation Tax Policy Blog, Jan. 1, 2013, https://taxfoundation.org/blog/details-fiscal-cliff-tax-deal. 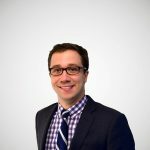 Gerald Prante & Austin John, Top Marginal Effective Tax Rates by State and by Source of Income, 2012 Tax Law vs. 2013 Scheduled Tax Law (as enacted in ATRA) (Feb. 2013), http://papers.ssrn.com/sol3/papers.cfm?abstract_id=2176526. Id. See also Ernst & Young, Robert Carroll, et al., Corporate Dividend and Capital Gains Taxation: A Comparison of Sweden to Other Member Nations of the OECD and EU, and BRIC Countries (Oct. 2012), http://www.svensktnaringsliv.se/multimedia/archive/00033/Corporate_Dividend_a_33823a.pdf. Prante & John, supra note 2. Carroll, et al., supra note 3. 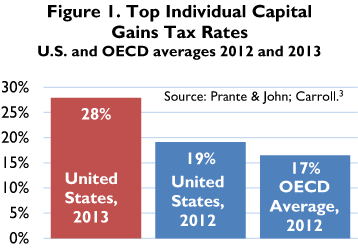 For an explanation of “integrated tax rates on capital gains,” see Robert Carroll & Gerald Prante, Corporate Dividend and Capital Gains Taxation: A comparison of the United States to other developed nations, Ernst & Young LLP (Feb. 2012), http://images.politico.com/global/2012/02/120208_asidividend.html. Arthur P. Hall, Issues in the Indexation of Capital Gains, Tax Foundation Special Report No. 47 (Apr. 1995), https://files.taxfoundation.org/docs/dafa29992e4cfa82276853f47607c84d.pdf. Bruce Bartlett, The Case for Ending the Capital Gains Tax, 41 Financial Analysts Journal 22-30 (June-July 1985). Chris Edwards, Advantages of Low Capital Gains Tax Rates, Tax & Budget Bulletin (Dec. 2012), http://www.cato.org/publications/tax-budget-bulletin/advantages-low-capital-gains-tax-rates. See Bartlett, supra note 8. 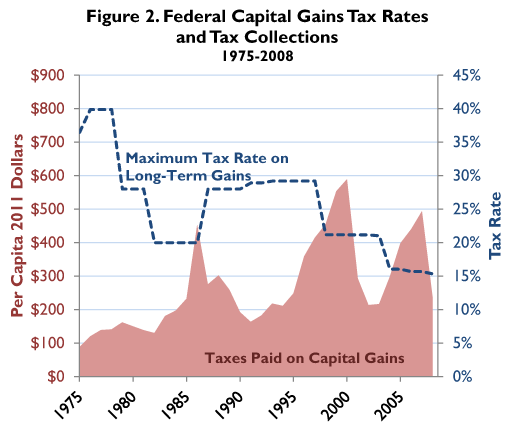 U.S. Department of the Treasury, Capital Gains and Taxes Paid on Capital Gains for Returns with Positive Net Capital Gains, 1954-2009, http://www.treasury.gov/resource-center/tax-policy/Documents/OTP-CG-Taxes-Paid-Pos-CG-1954-2009-6-2012.pdf. Tim Dowd, Robert McClelland, & Antiphat Muthitacharoen, New Evidence on the Tax Elasticity of Capital Gains, Joint Working Paper of the Staff of the Joint Committee on Taxation and the Congressional Budget Office (June 2012), http://www.cbo.gov/sites/default/files/cbofiles/attachments/43334-TaxElasticityCapGains.pdf.